Lock in a great price for Colonia Suite Apartments – rated 9.3 by recent guests! The artful design, layout and decoration of the suite and the common areas was wonderful. It stimulated the senses and the mind. Plus everything worked..TV, wifi, hot water, kitchenette with coffee and tea options; all the amenities seems to have the traveller in mind. Breakfast was great and could be eaten in the garden or inside. I would be happy just living in that space! Location was also convenient, and parking was available in front of the hotel. The decor of the room made the stay comfortable, relaxing and very inviting. Luis provides a service that is becoming difficult to find. Personal service. The artist room is very spacious with a couch, dining table, kitchen and balcony. Hotel is only half a block from the main street. The decor is historical which goes along with the old town. A garden in the back was an escape that we appreciated and found very relaxing. Great central location close to everything. Historic downtown, bus terminal, and ferry. Such a great quite and relaxing atmosphere. Very peaceful place to stay. This property is beautiful, easy to get to from both ferry and bus stations. I would definitely stay here again. 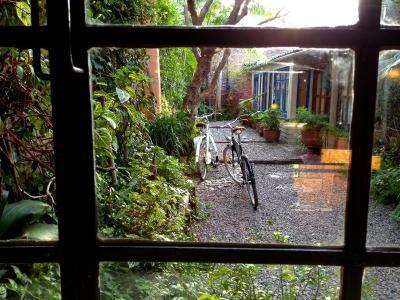 The bungalow is cozy, charming, quiet and private. 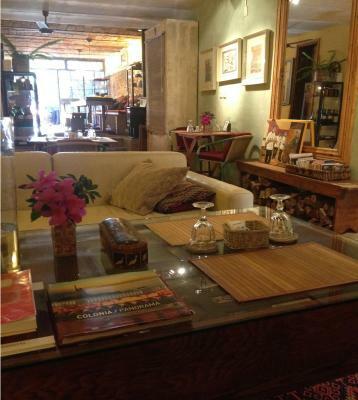 The location is not in the middle of old town but very walkable to everything. The host is friendly and accommodating without being over bearing. We absolutely loved our apartment! Luis was such a gracious and helpful host. Every detail was thought of and he helped us set up our tours and tastings at several wineries in the area. We would highly recommend Colonia Suites to anyone visiting beautiful Colonia. It is a lovely, picturesque city with so much charm. The property was very clean and nicely appointed. The bed was very comfortable. The suites were in a good location, quiet and romantic. The breakfast was delicious and convenient especially given the fact that there are fewer coffee shops than I expected. Luis was helpful with directions and suggestions. 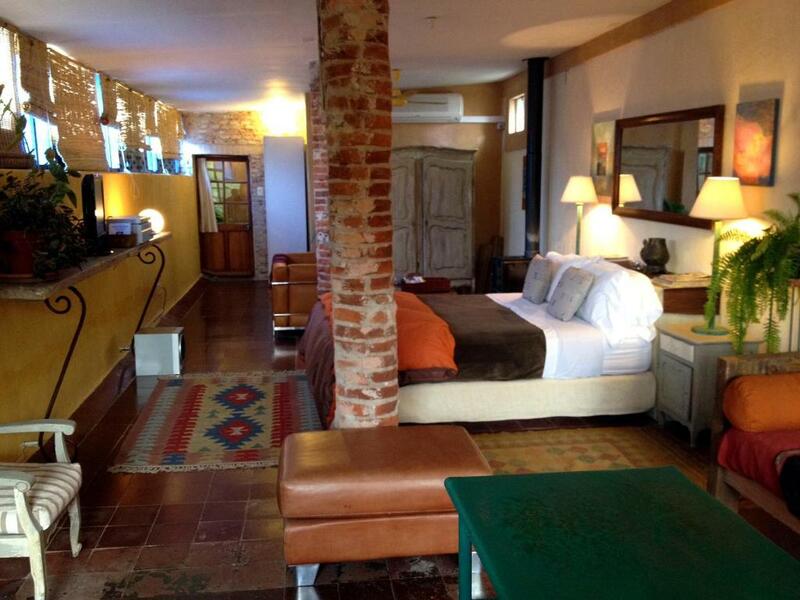 We would definitely recommend a visit to Colonia del Sacramento and would stay here again. We stayed in the apartment and literally died and went to heaven. No other way to describe it. I wish that this was my home. Wonderful for the soul. Thank you, Fred and Selena!! Colonia Suite Apartments This rating is a reflection of how the property compares to the industry standard when it comes to price, facilities and services available. It's based on a self-evaluation by the property. Use this rating to help choose your stay! 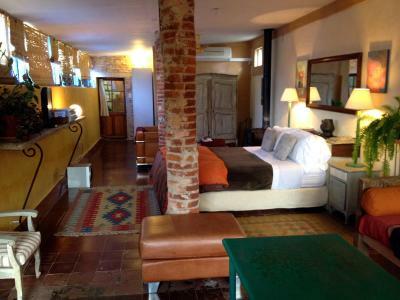 Colonia Suite Apartments offers elegant country-style accommodations with free Wi-Fi in historical Colonia del Sacramento, 650 feet from Colonia Beach. It offers art classes in the atelier and beach horseback riding. Apartments at Colonia Suite Apartments have rustic interiors with modern facilities. All have red-brickwork walls and wooden floors, and are equipped with an LCD TV and DVD player, and kitchenettes. Guests at Colonia Suite Apartments can relax in the central courtyard, decorated with tropical plants and colorful flowers. 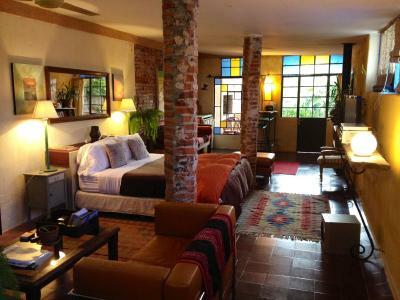 Due to its central location Colonia Suite Apartments is close to several lively restaurants and bars. Medical assistance is also available on site. Colonia Suite Apartments is 1,950 feet from Fernando Park. When would you like to stay at Colonia Suite Apartments? A bright and colorful apartment with décor honoring the Mexican artist Frida Kahlo, it features a private bathroom with hairdryer, kitchen facilities, flat-screen cable TV. There is air conditioning, heating and a bar with stools, suitable for eating light meals at, there is a microwave. 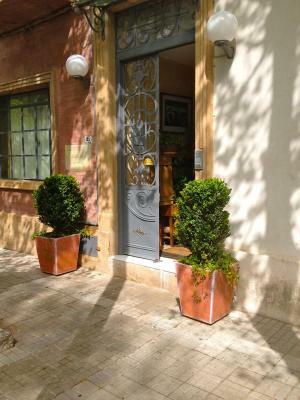 An air-conditioned apartment that pays homage to Jean Miro with its paintings, it features a private bathroom with hairdryer, kitchen facilities and chic décor styled with exposed bricks and rustic wood furnishings. There are 2 original leather chairs by the designer Mies van der Rohe. It is equipped with flat-screen cable TV and a DVD player. There is a bar with stools, suitable to eat light meals at. It cannot accommodate children. This bungalow is surrounded by garden. It has a microwave and a mini-bar, a seating area and air conditioning. This spacious apartment was once a painter's studio and remains full of light. It features a private bathroom with hairdryer and flat-screen TV with cable channels and CD player. 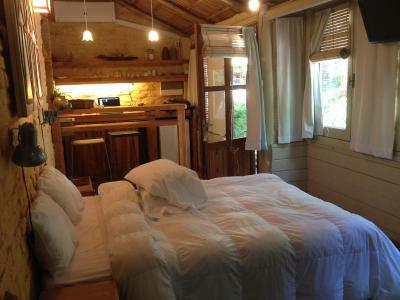 There is a balcony looking onto the garden, a wood-burning stove, a seating area and a mini-bar. There is also heating, air conditioning, a refrigerator, electric kettle microwave and kitchenware. House Rules Colonia Suite Apartments takes special requests – add in the next step! Colonia Suite Apartments accepts these cards and reserves the right to temporarily hold an amount prior to arrival. Please note that the Double Apartment cannot accommodate children. The property offers painting lessons of different techniques, tailored to the guest's level of experience or preference (for a surcharge). Comfortable, well located, quiet, quirky apartment. Friendly, helpful, charming reception staff. The decor, location and friendliness of the host! Breakfast was a bit overpriced. 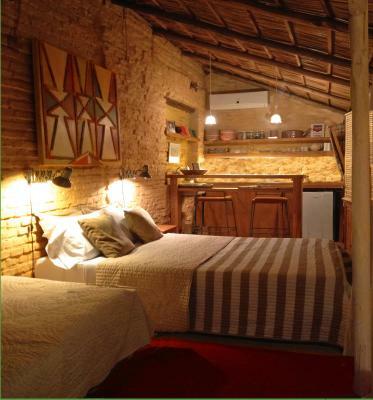 Property is in a great location, very close to the historical centre, the ferry terminal and the bus station if coming from Montevideo. The rooms are huge with quite a lot of character and attention to details. I will definetely stay again. The breakfast was great,lovely fresh fruit,yogurt, muesli and cereals and everything elso you would want. Meticulously clean large character filled room within easy walking distance from the terminals and the old city. Fantastic host Luis meet every need and planned a great day trip to Carmelo wineries. Superb! Our Host Luis was really polite and helpful. Everything was ready when we arrived. He gave us a town map and tell all places what he recommend us to see . The athmosphere in the Hotel was like a fairytale. Every detail was planned and amazing. Paintings hanging around the walls, books to read and everything was near . Room was very clean and they filled every day coffee and Tea facilities. Highly recommend from us! Breakfast wasn’t included in the room price (available for a charge) but this was clear prior to booking and it didn’t matter to me anyway as the room I stayed in had fridge facilities and there were plenty of breakfast options within a block or two of the apartment. Luis was a delight, helpful on check in with a map of the area and suggested places to go and sight seeing options. The apartments were beautifully and creatively decorated including the common areas with a lovely little courtyard area a nice place out of the hot summer sun. Our room was very spacious. Funky decorating. We stayed at the cabana in the garden. The whole place is not only super clean but also decorated with a lot of taste and lovely cute details. It is an oasis! The owner is very welcoming and friendly and makes you feel at home. The breakfast has all you need to get you started for the day. This is one of the best places I have ever stayed at. Great service amazing set up very clean and charming!! !